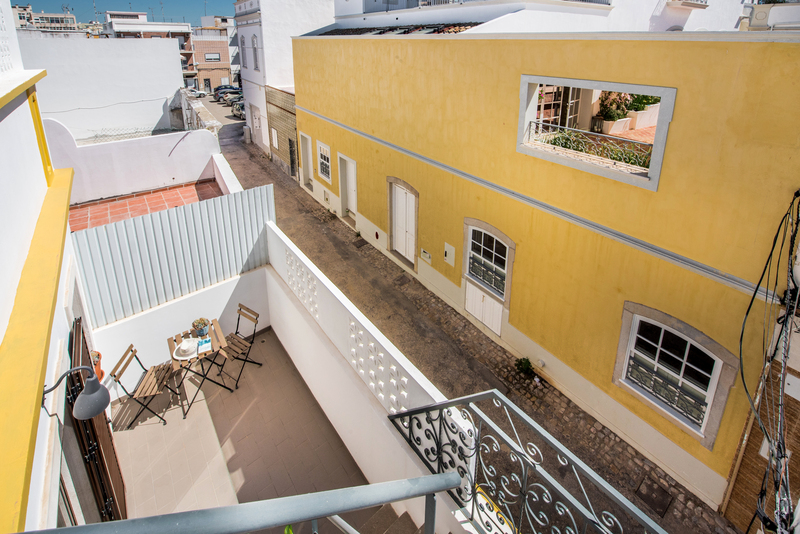 Casa Agave is a wonderful old renovated townhouse right in the heart of Old Town Olhao. 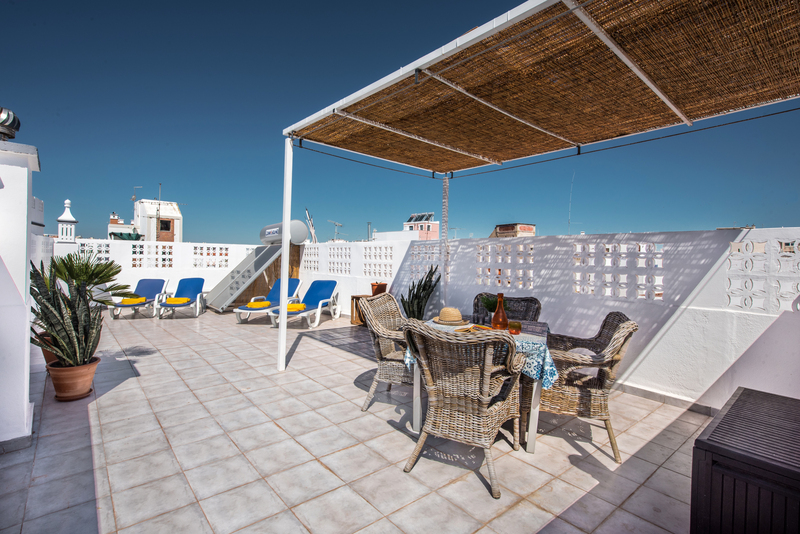 The roof terrace provides exceptional views over the town. 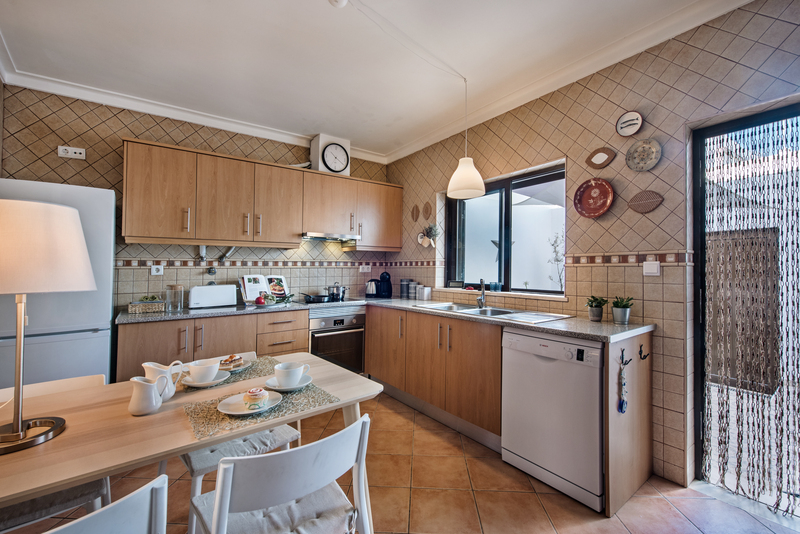 The house offers modern comforts including WIFI and air conditioning. 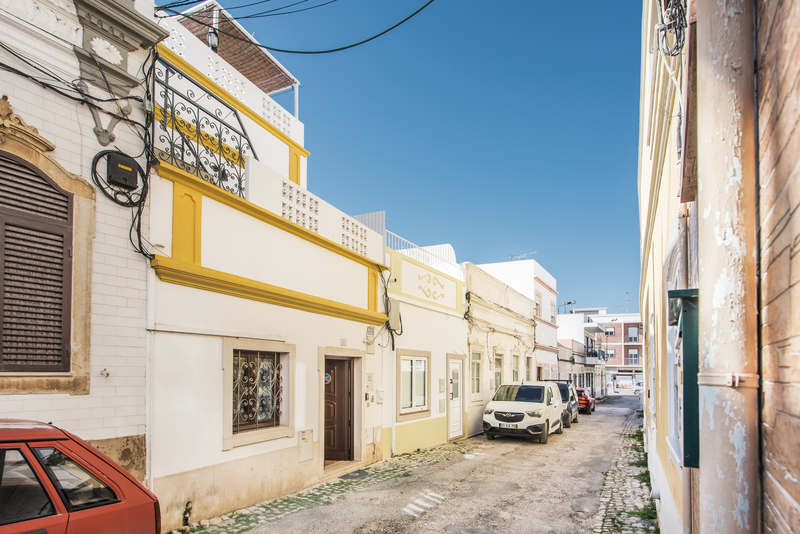 This splendid 2 bedroom townhouse is centrally located right in the heart of the old part of Olhao town centre surrounded by old merchants houses and fishermen's cottages. 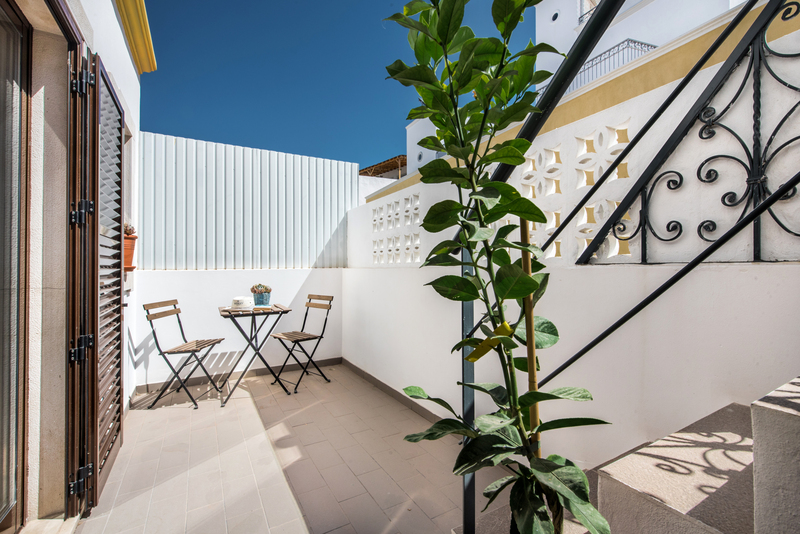 Renovated to an excellent standard the 2 bedroom house offers comfortable living and the added extra of a stunning roof terrace to enjoy. 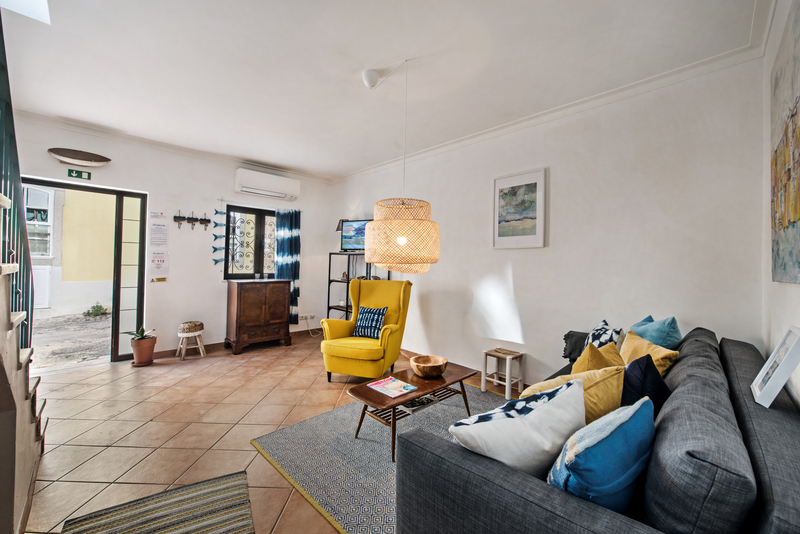 A modern front door with a 5 lever lock opens up from the small side street that Casa Agave sits on straight into the spacious and light living area. The door and side windows are double glazed making sure no draughts come into the living room and keep the house nice and secure and warm in the cooler winter months. Directly in front of the front door is the stair case that leads to the first floor and bedrooms. The banister is a decorative green painted ornate wrought iron design so adds a wonderful feature to the house but also allows light to circulate the living room. Once through the front door the living space is located at the front of the 2 bedroom house. A window to the left of the front door lets in much loved natural light. Over the window is a very traditional and ornate wrought iron security fence allowing the window to be open and the house to still be secure. Below the window is a lovely old antique sideboard adding some local character to the room. A set of shelves are used to stand the flat screen television that offers a small selection of European channels. Here is also the WIFI unit that supplies good internet to the whole of the 2 bedroom house. The floor is quite traditional terracotta coloured tiles wonderful to help keep the house cooler in the long hot summers. The walls are painted white keeping a simple yet light and easy theme to the room. A wonderful yellow fabric armchair and grey fabric sofa offer great places to sit and enjoy the living space. They are decorated with colourful cushions to add some interest to the living space. The room has some lovely touches to give a sense of relaxation to the living space in our 2 bedroom townhouse. The living room in this fabulous 2 bedroom townhouse has the added extra of air conditioning. This unit is great as it efficiently provides cool air during the summer months to keep the house nice and cool when you are home. But in the cooler winter months it can provide lovely cosy warm air to keep the room warm and inviting in the evenings. In the centre of the living room a gorgeous little wood burner has been installed. This really adds an extra dimension to our 2 bedroom townhouse and makes it a really appealing choice for the Winter sun lets. From the rear of the living room an archway leads to the back of the house on the left is a bathroom and through another arch is the kitchen. 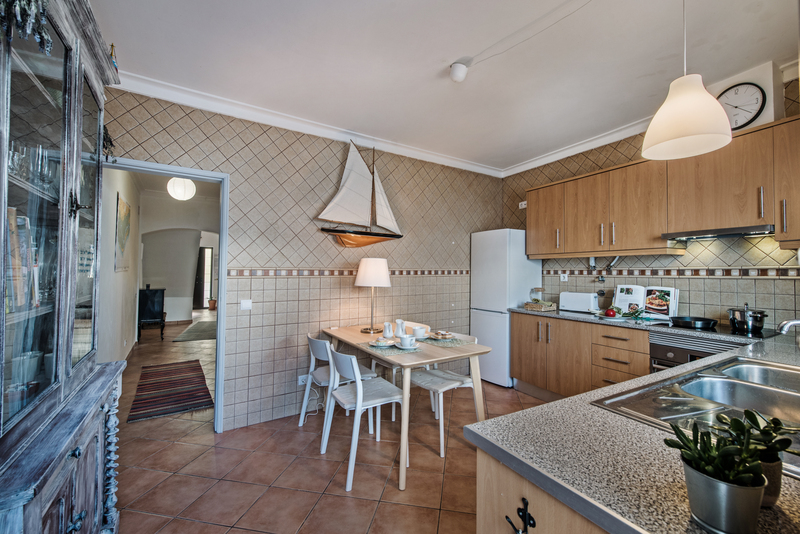 The kitchen in our 2 bedroom townhouse is a wonderful old large room great for cooking and eating together. 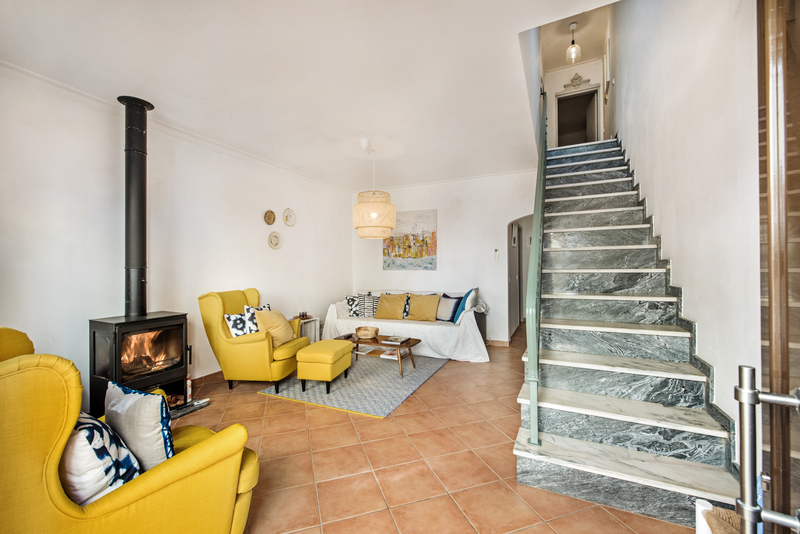 A table and four and chairs are placed in the kitchen and a huge welsh style but Portuguese antique dresser dominates the room reminding you of the past residents and how they lived. Along 2 wall is fitted and modern kitchen units stuffed full of everything you would expect to find in a family kitchen. The kitchen at Casa Agave also provides a full size fridge freezer, electric oven and hob with a built in inox extractor fan. A dishwasher, kettle, toaster capsule coffee machine and microwave. A light marble worktop clean white and patterned wall tiles and traditional terracotta floor tiles compliment the room. Above the sink is a large window with shutters that looks out over the enclosed back yard. From the kitchen is a door that leads to a totally enclosed back yard with a door leading to a the back lane for the 2 bedroom townhouse. Staying on the ground floor for a moment. Between the living space and kitchen is a large bathroom. Here you will find a washing machine. 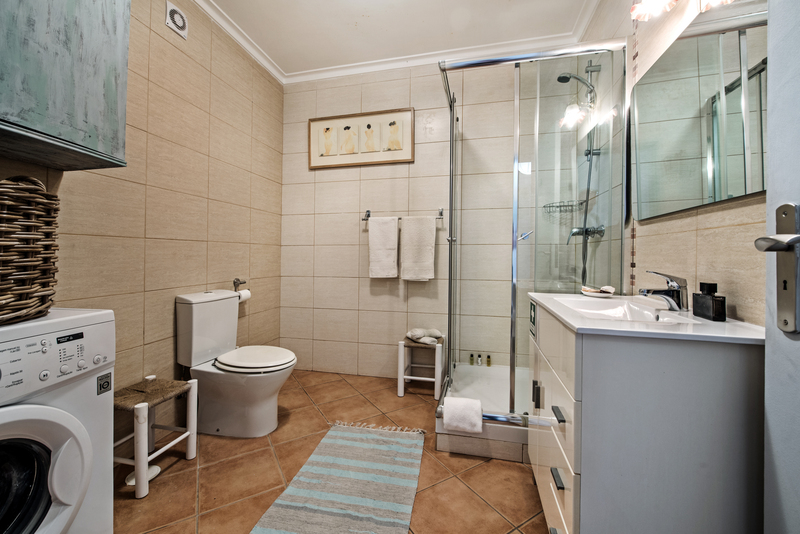 The bathroom is designed with a pleasant shower cubicle a toilet and basin set into a pretty vanity unit. Over head is a huge mirror and in the unit you will find a hairdryer and also plenty of space to store toiletries and cosmetics. 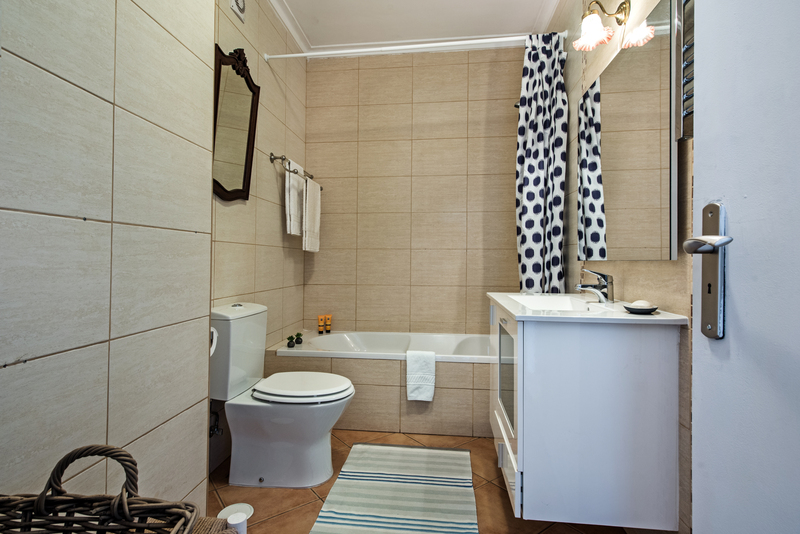 The bathroom is tiled in lighter tiles to give a large feel to the room and the terracotta tiles adorn the floor. On the first floor is the first bedroom to the front of the 2 bedroom townhouse. It offers 2 single beds together to make a lovely large super king size bed and is made up with 2 set of crips white single linen. Light blue cushions and a colourful throw add colour and warmth to bed the bed making it very inviting. Each side of the beds are modern white lacquer bedside tables each with a white lamp. The bedroom has been decorated with a nautical theme in mind. At the front of the bedroom is large french sliding doors surrounded with matching blue curtains. These doors lead on to a private terrace that overlooks the front of the 2 bedroom house and the quiet street below. 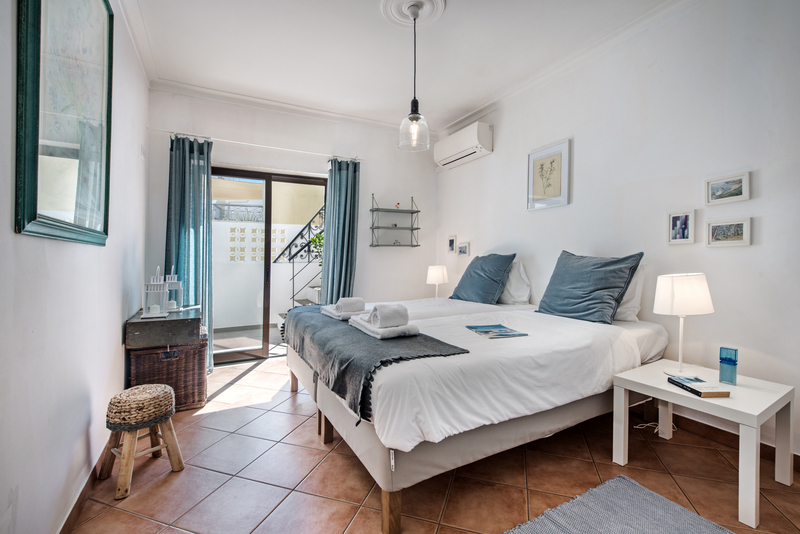 The bedroom has the luxury of a modern air conditioning unit to keep you nice and cool in the hot Algarve summer and lovely and warm on the cooler winter nights. Between the 2 bedrooms is a bathroom to share. The walls have been tiled in super large beige slightly patterned tiles to make for a modern and clean style room. This bathroom has a fabulous full size bath with an over head shower to enjoy. There is a toilet and also a modern square white basin set in to a modern white vanity unit.You will find a large and modern mirror above the vanity unit and also a lovely antique style mirror to add some variety to the bathroom. 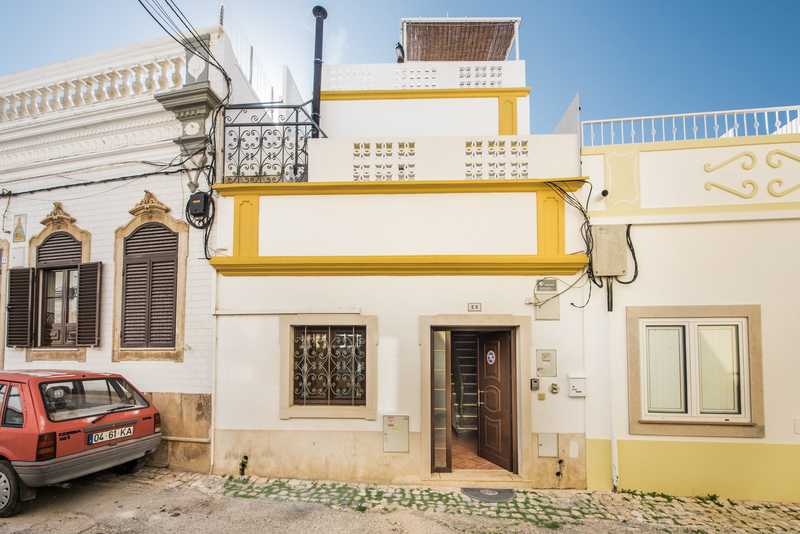 The second bedroom is to the rear of this wonderful 2 bedroom townhouse. It offers 2 large single beds together to give a super king bed. This bed has been made with a suer king set of linen so makes a superb and comfortable bed to enjoy. 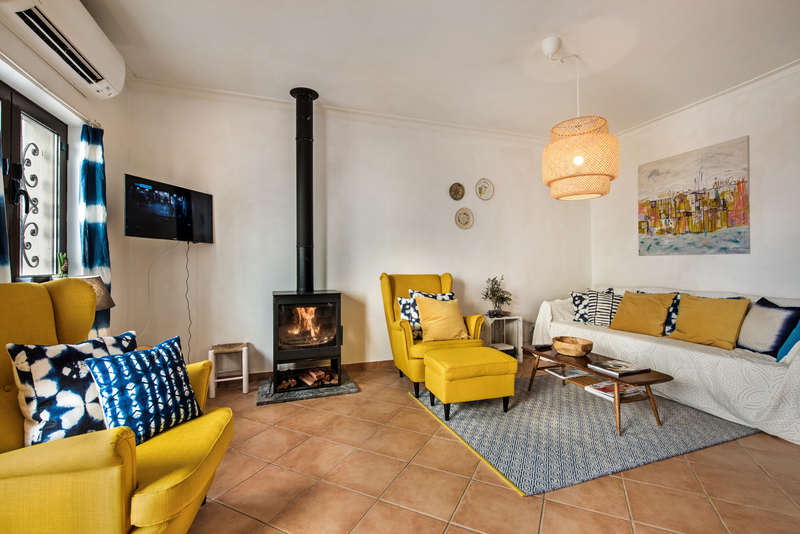 Cushions have been placed to add colour and tsyel and each side are antique bedside units to remind you of the area you have chosen for your holiday. A lovely old dresser acts as a dressing table, decorated with some little antique ornaments, and with the typical marble top favoured so much in Olhao. A charming aqua green armchair has been placed in the bedroom, making for an enchanting quiet place to sit next to the french windows that lead on to a private terrace overlooking the little back lane of Casa Agave. The windows have matching seaside blue curtains and the doors have traditional shutters that an be used o keep the bedroom call and dark in the warmer and lighter summer months. The bedroom has fitted wardrobes offering plenty of hanging space and storage. An air con unit has been installed great for cool or warm any time of the year. 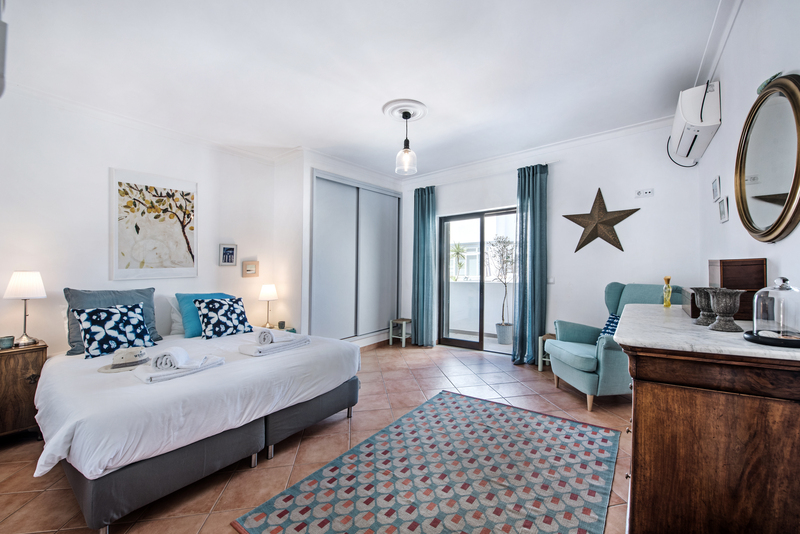 Both bedrooms have excellent quality beds that will be exceptionally comfortable for your holiday. Decorated very thoughtfully the rooms are a pleasant and wonderful space. From the kitchen on the ground floor is a wonderful outside space that is totally enclosed from the lane that runs along the back of our 2 bedroom townhouse. Below the kitchen window we have placed an old restored pine table and white chairs. We have kept some plants that we might ask you to water to add some colour to the space and above is some sails used as shades from the sun. The floor has been decorated with mosaic style tiles to give a Moorish theme. This makes for a very private and quiet area to enjoy food, drink and time to relax. The first bedroom has shuttered french windows that lead on to a private terrace that overlooks the front of the 2 bedroom house. we have placed a delightful table and 2 chairs to enjoy this quiet space. 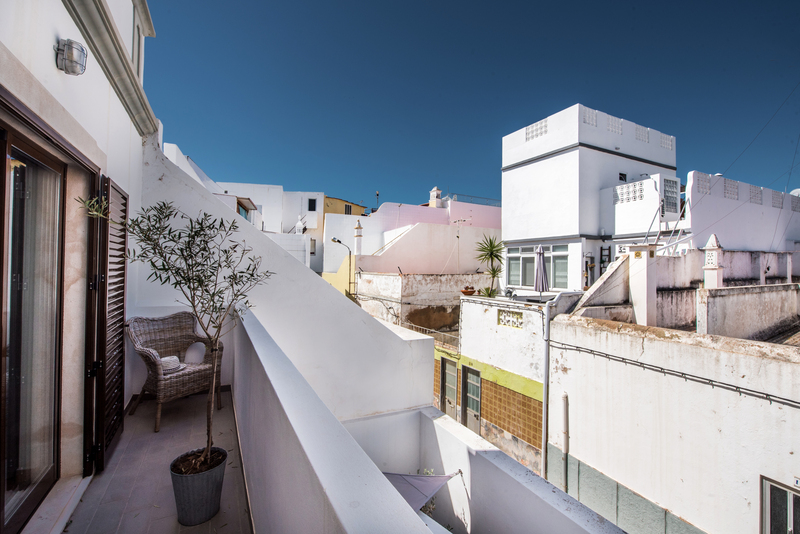 From this terrace outside traditional Olhao style steps lead up to a huge roof terrace. This is the most amazing extra space and adds a whole new dimension to our 2 bedroom townhouse. A bamboo shade at one corner of the terrace offers shady place to sit and enjoy the beautiful sunny rays. Underneath the shade we have placed a table and four large comfortable rattan chairs. This makes for a sublime place to enjoy a quiet read of a book, magazine or newspaper but also a great spot for some company and al fresco dining. 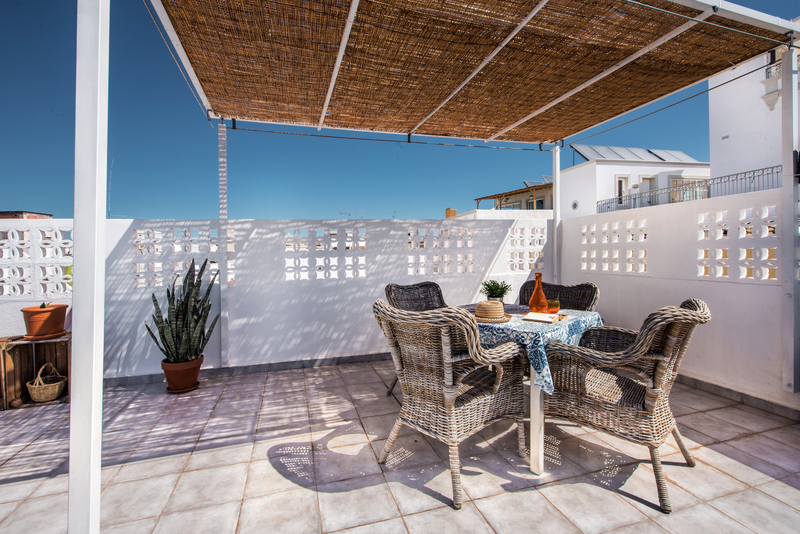 The roof terrace looks after the solar panels that provide hot water for the house. 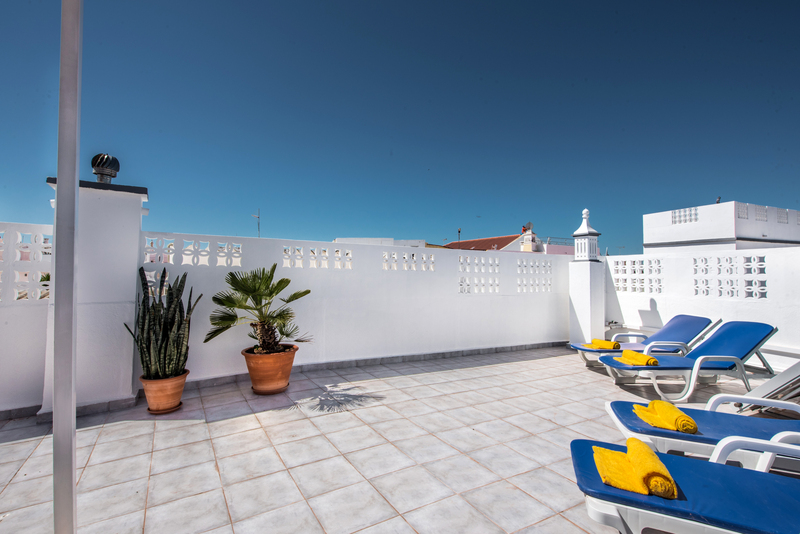 These take up a small area of the terrace but then we have a selection of sun loungers that can be moved around to cater for the sun worshippers! The terrace is surrounded by a good high wall making it a safe place to be and to makes light is capitalised the higher bricks are decorative with patterns that allow light through. 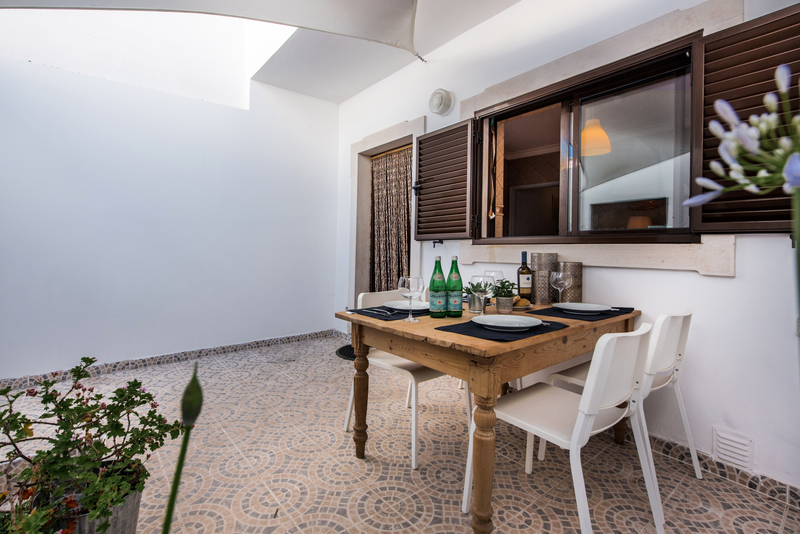 From the second bedroom is yet another terrace that overlooks the lane behind the 2 bedroom house and has one chairs to give a pleasant and quiet place to sit enjoy the ambient weather and reflect on your wonderful holiday experiences. 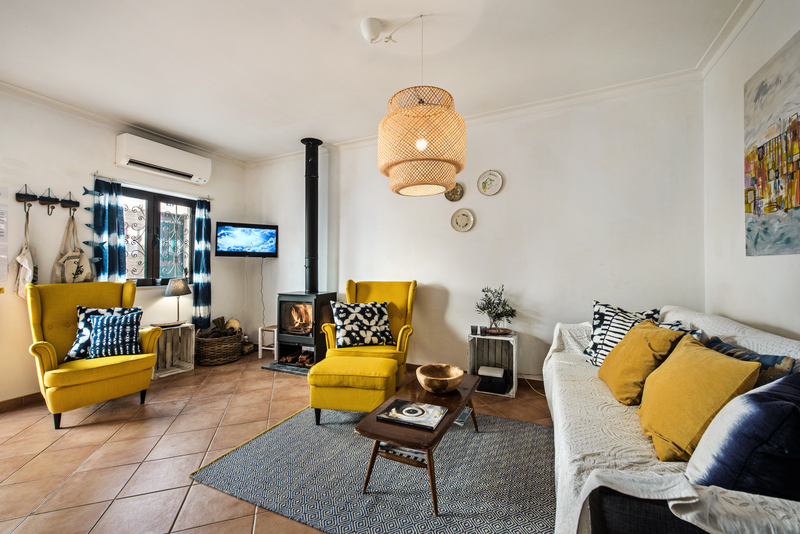 Casa Agave is an old townhouse, no doubt once a fishers mans cottage that has been very tastefully renovated and decorated to give the occupant and little piece of the history of Olhao but with all the modern day comforts including the all important air conditioning for the hot weather. 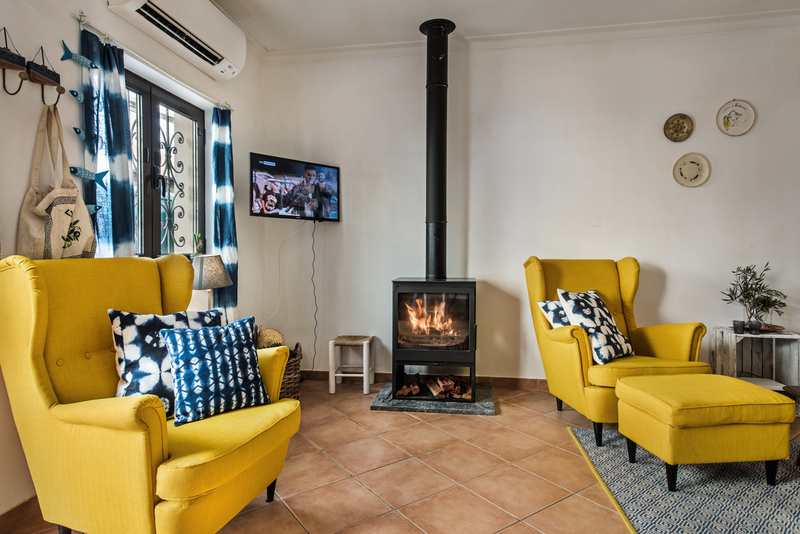 The lovely fact about this house is that the air conditioning can also be used to warm the house, making it a great holiday home any time fo the year. 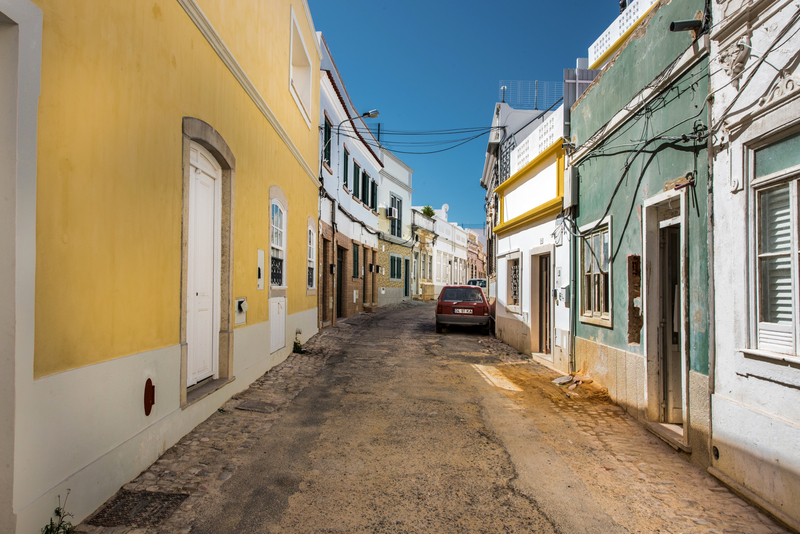 Olhao and the East Algarve as so much to offer out of season and can be a fantastic place to visit out of season. 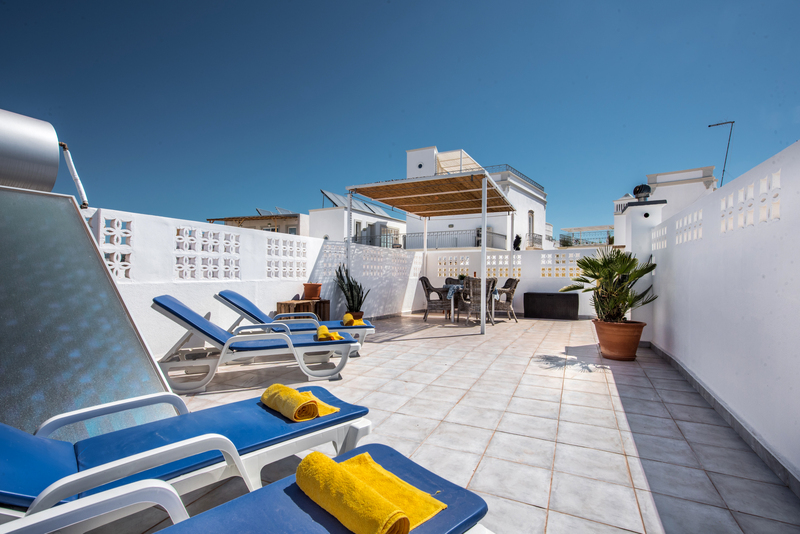 Located in the heart of the town Casa Agave really is very close to all you could need. This includes the bus and train stations, restaurants, supermarkets daily markets and local shops, banks, post office and chemists. Olhao is particularly great for local seafood and well priced restaurants with simply divine food. 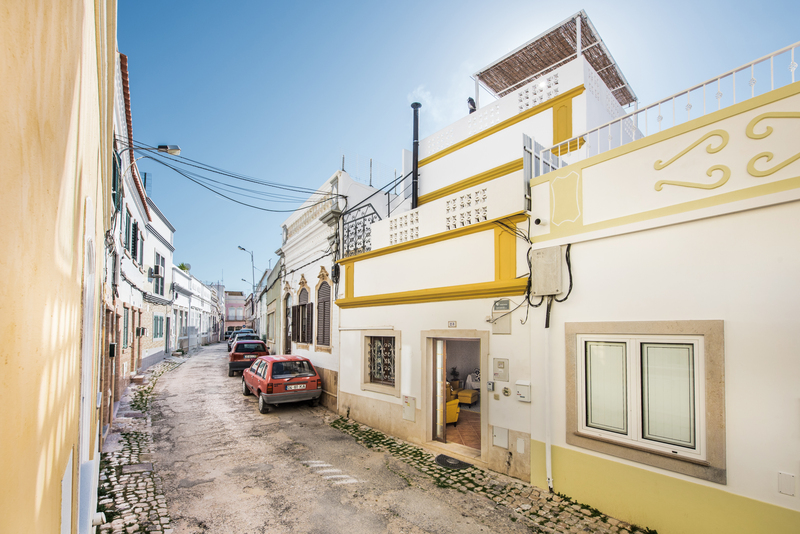 Interestingly Our 2 bedroom townhouse sits in the same road as a wonderful old merchants house that was lovingly renovated after having nearly completely fallen down and it is now a very popular yoga and relaxation retreat so this gives you an idea of the wonderful tranquillity Olhao can offer beside the historic fishing families still local to the town. Our lovely 2 bedroom townhouse comes with its own manual that you can download to your tablet or smart phone. Packed full of information to make the best of your holiday starting from the moment you arrive. It tells you how to collect the keys, who will look after you during your stay and clear concise directions to Casa Agave. Then it is packed full with details of the best restaurants, taxis and local amenities and activities. Lovely townhouse in an excellent location. 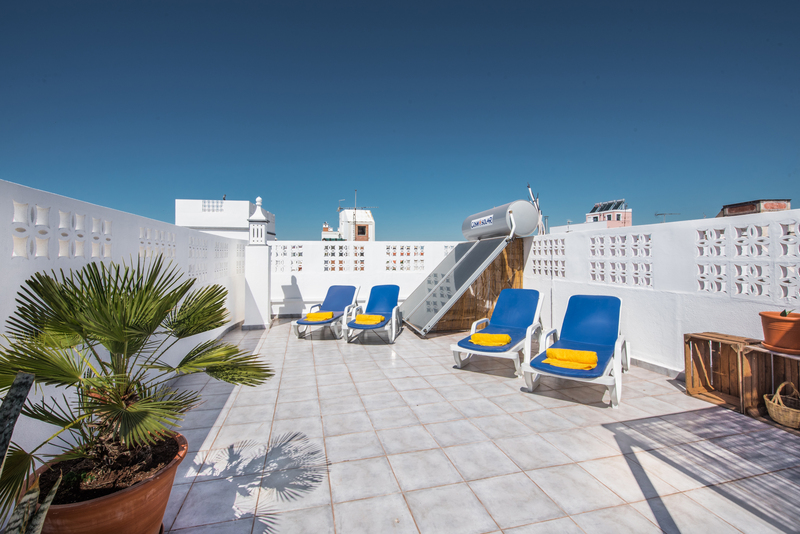 Great roof terrace for sunbathing. Very comfortable and clean and exceptionally quite at night for a good nights sleep. Very near to the marina or the ferries to the islands. Wonderful restaurants and friendly locals. We will be back! "House really well located and well furnished. 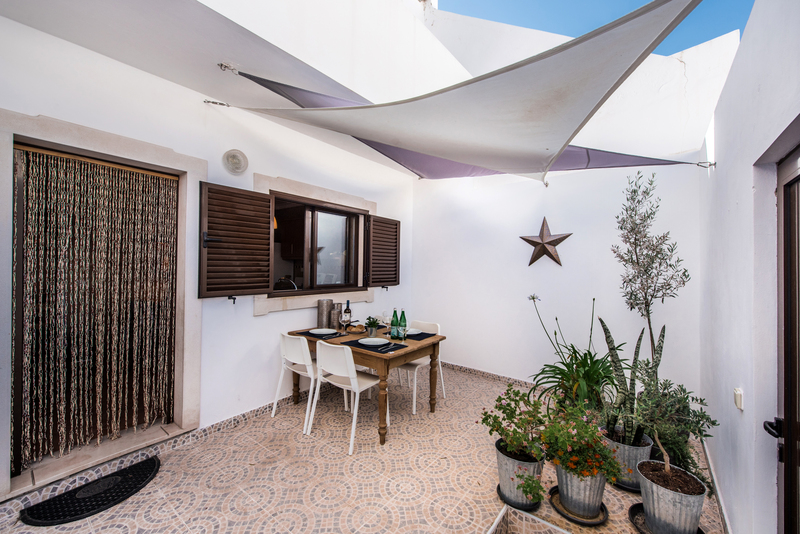 The terrasses upstairs is just perfect and the two bedrooms really comfortable. "Maison très agréable et rooftop parfait ! :)"
Sehr schönes Haus, mitten in der Altstadt von Olhao. Die Einrichtung ist sehr geschmackvoll und sehr wohnlich. Die Dachterrasse ist ganz toll! Der Sonnenuntergang kann von dort oben wunderbar genossen werden. I'm missing Casa Agave already and Olhao! Waking up in New York City today was much different and I miss my morning walk to the market for fresh produce. I can't thank you all enough for a WONDERFUL stay and I look forward to coming again sometime as I truly fell in love with the area and was so impressed by everyone at your company and your fantastic service.